1799 Draped Bust dollars are the most common in the popular Draped Bust dollar series. 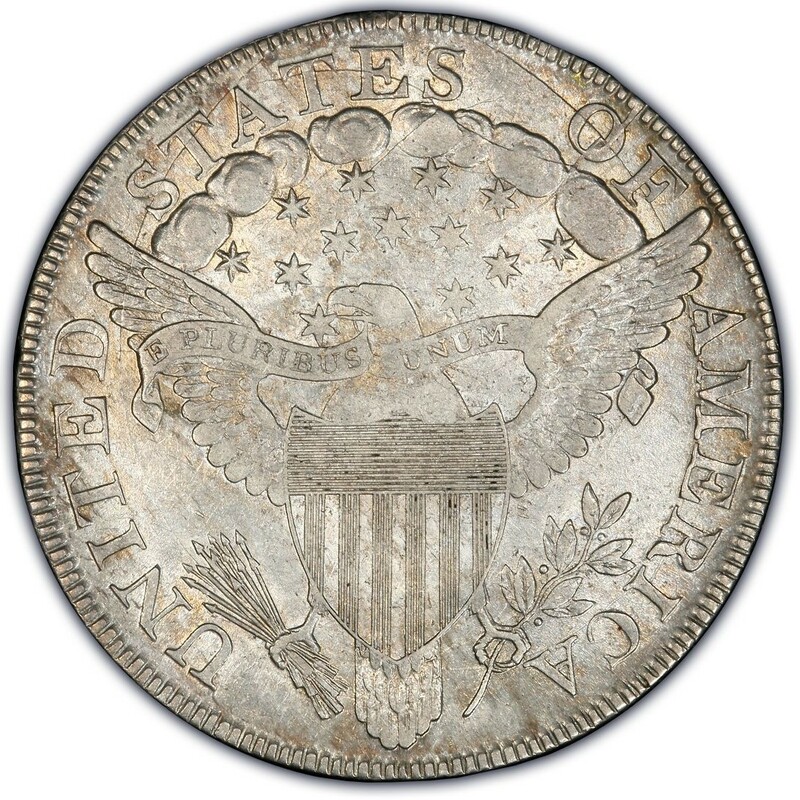 They are also the top-collected date in the series, loosely tied only by the 1798 dollar, which is more or less equally encountered in the marketplace these days, even if there were fewer 1798 silver dollars minted than 1799 silver dollars. By most estimates, the 1799 dollar, designed by Robert Scot, represents the bulk of all surviving early American dollars, with perhaps 8,000 to 10,000 existing in all grades. As is the case for virtually all coin survival estimates, this includes damaged specimens, including holed, gouged, and cleaned specimens. Problem-free 1799 dollars are much tougher to find. 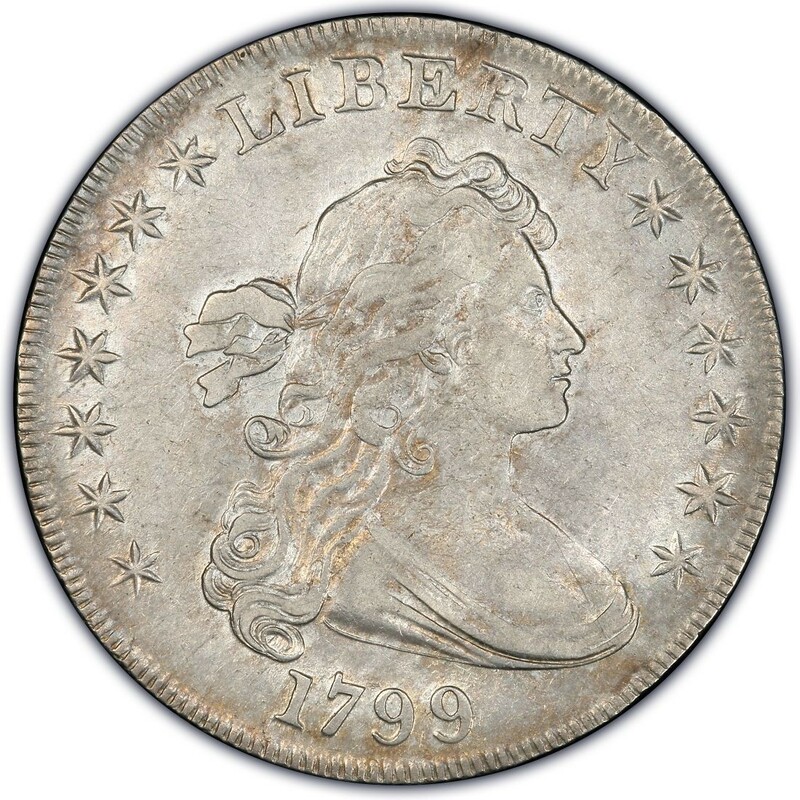 There are several types of attributed die varieties for 1799 Draped Bust dollars, and there are collectors who will actively pursue several if not all of these. While it’s an expensive endeavor, collecting all possible Draped Bust dollar varieties is a relatively popular activity, especially due to the immense interest in collecting Draped Bust dollars as a series. Inclusive of all the varieties listed above, a grand total of 423,515 silver dollars were minted in 1799. While there aren’t any official mint figures to help collectors officially determine which varieties are more common than others, the 1799, 99 Over 98, 15-Star Reverse dollar and 1799, 8 Stars Left, 5 Stars Right dollar are slightly more expensive in typical trading. On average, problem-free Good-4 1799 Draped Bust dollars retail for $1,000 to $1,200. Pieces with more severe issues are usually traded in the range of $600 to $900.